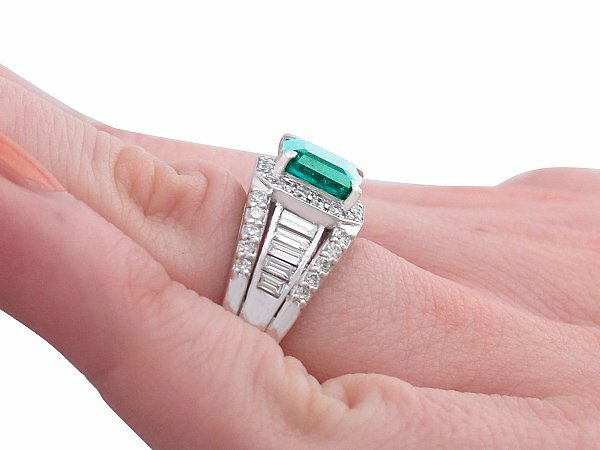 This fine large, contemporary large emerald and diamond ring has been crafted in platinum. The substantial pierced decorated frame displays a feature step cut natural emerald set to an Art Deco style design. 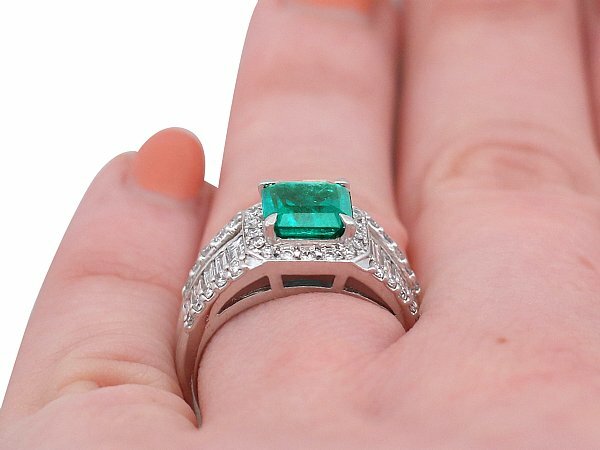 The emerald is bordered by a total of eighteen modern brilliant round cut diamonds, pavé set to a rectangular cut cornered design. Ten baguette cut diamonds, graduating in size, are inset to the middle of the shoulders. The shoulders are embellished with a further twenty, four claw set modern brilliant round cut diamonds that border the middle row. 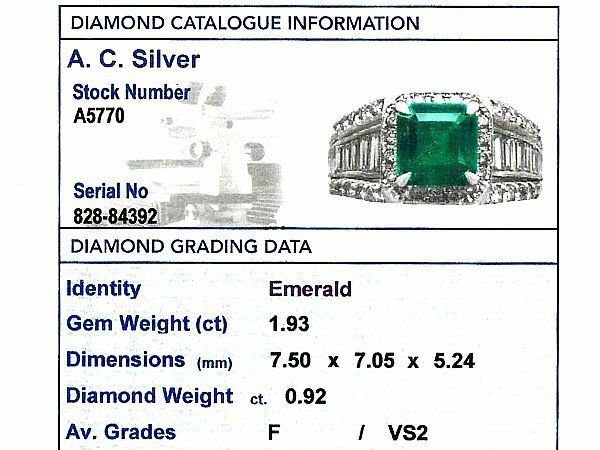 The elevated, flared, bifurcating shoulders integrate almost seamlessly with the hallmarked platinum ring shank, struck to the interior with the mark for platinum (PT900). 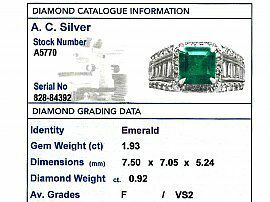 This large emerald and diamond ring is supplied with an independent diamond grading report card. Reference: The Connoisseurs Guide to Precious Gemstones, R.Wise, Brunswick House Press. This impressive ring is fine quality, set with high colour graded diamonds. The ring is in excellent condition with clear hallmarks to the interior of the shank. Reflections in photographs may detract from the true representation of this fine example of contemporary jewellery (jewelry). The images do not reflect the true colours of the gemstones. The video however provides a more accurate reproduction of the actual colour. 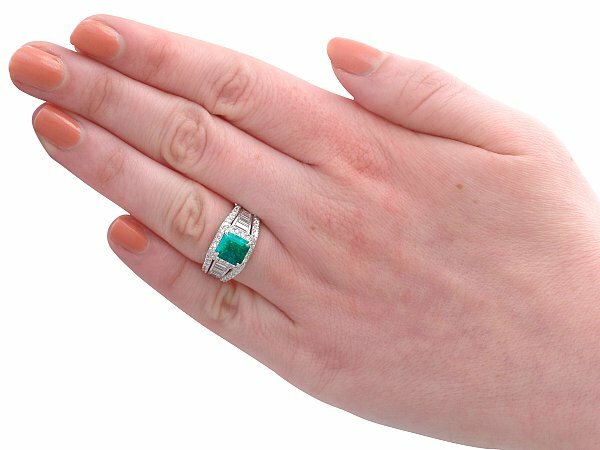 The ring size may be professionally adjusted in size on request to meet your personal requirements, however by a minimal amount due to the shape of the setting.